The other evening I held a session at an unconference put on by some virtual-world-savvy IBM types. The (un)conference was called "Seeking business value from investment in virtual worlds on the 3D internet", aka "Beyond Blogging". 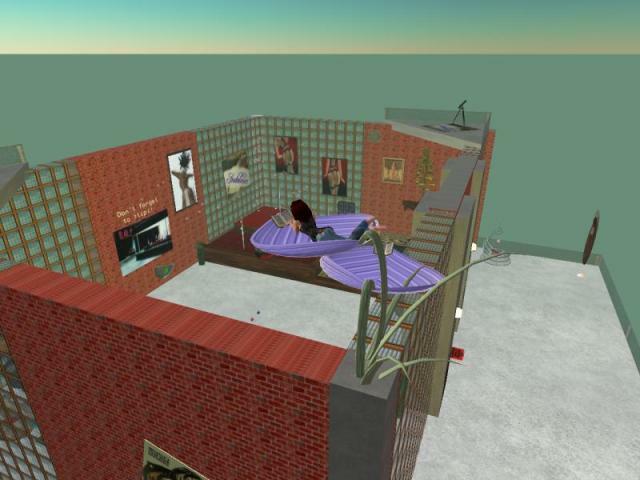 My session (the last on the first day) was "Field Trip: Social Aspects of Virtual Worlds". My original plan was to take a bunch of inexperienced AVs out and show them what fun Second Life can be (since, as the abstract says, this is an important part of understanding our potential customers). But it turned out that most of the attendees were far from newborn, and already knew how to poke a danceball. So I just took everyone up to Indolence and we partied and danced and discussed business models and adult content and stuff. I was fun! And not one person seemed to mind any of the pictures on the walls. A good time was, I think, had by all. And I got to see Indolence again (I just recently took it back out of my pocket after having it packed up for some time), which was very nice. I should have more parties there. 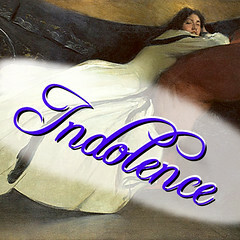 The logo is John White Alexander’s “Repose”, plus about ten minutes in PhotoShop. :) As usual click through to flickr for more context. The lovely reading-lillies are from Rhea Newall of Ribbons & Roses, one of my favorite people evar; the pictures of ladies’ bottoms dimly visible above the stage are by Callipygian Christensen (another favorite person), etc, etc. Despite being a dance club in form (right down the the box that gives out free logo T-shirts), I’ve never actually had a party or a dance or an event there. In fact there may never have been more than three people there at once.